I love food. I grew up in a household surrounded by rich aroma of food. My childhood is all about coming home to a house filled with fantastic meals and treats. My mom took pleasure in preparing gastronomical feasts for the family. We were allowed to eat junk foods spiked with lots and lots of MSG, salt and transfat. My dad would often come home with chocolate goodies and yummy desserts. We were more or less given much freedom to decide on the kind of food we would want to eat especially when it comes to snacks. Healthy, balanced diet was not a top priority. As long as we are happily sated, whatever we like to eat was fine with my parents. It was no wonder then that my dad’s diabetes eventually turned to worst. It was only when he was seriously struggling with this disease four years ago that we decided to make real drastic change in our lifestyle. But by then, it was already almost too late. My sister, who was 30 years old at that time, was diagnosed with diabetes and I started to experience problems with my health too. Blood tests showed that I have high levels of triglycerides and bad cholesterol. I was also suffering from vertigo and fatty liver. Random ultrasound test also showed a small cyst in my liver, to which succeeding ultrasound revealed has grown in size and has turned into a mass. Though CT Scan test proved that there was no cyst or mass at all, the stressful experience and scary thought that my liver was sick were enough to make me turn my life around. As we all know, liver is very important as it performs a wide variety of functions. It is considered as the chemical factory of our body. Everything that we take in are processed by the liver. That is why it is vital that it is always in perfect health condition. It was on this note that I took proctive steps in making sure that my liver gets all the tender, loving, care that it needs. I really don’t want to end up with a damaged liver at such a young age. I learned that the most important step in taking care of the liver is adapting a healthy lifestyle. This includes eating healthy food such as green vegetables and colorful produce that contain naturally occurring antioxidants that can help protect liver cells against diseases and chemical injury. Avoiding processed food and those high in sugar, unhealthy fats and food additives is a must too. I have to admit that it is quite hard to do that these days especially since these are the kind of food that are readily available in the supermarkets. Add to that the overwhelming presence of many food products that disguised themselves as healthy snack alternatives. But then if we don’t want to end up eating the ones that might do more harm in our body than good, we really have to be discerning with our food choices. It would greatly help to learn to read food labels to know which ones are fake and which ones are authentic healthy ones. I chanced upon Soyami during one of our grocery shopping trips. I was attracted by well, its packaging at first and its catchy name. Upon reading the food label and after doing some research, I discovered that it is made from real soya. It has absolutely no MSG, is high in protein and calcium, and has absolutely 0 % transfat. As we all know, Soya has become an instant hit among health buffs for the many good benefits it can provide. It is known to reduce heart disease. It contains isoflavones, an anti-oxidant, which helps prevent breast-cancer. And here’s the best part, it is known to lower cholesterol and triglycerides. Four servings of soya products each day may lower the levels of LDL (low density lipoprotein) in our body (a.ka. the bad cholesterol). Since it is a must that I keep my triglycerides, cholesterol and blood sugar within normal level, this is just the perfect kind of snack that I absolutely need. 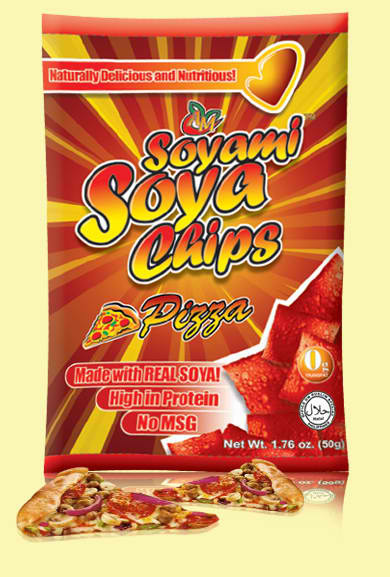 Soyami Soya Chips comes in three flavors: Original, Pizza and White Cheddar. I have simple taste so I usually go for the Original Flavor, while my husband and daughter, who are both adventurous when it comes to food, like the Pizza flavor. My mom though, recently have taken a liking to the White Cheddar flavor. You see, eating is indeed a family affair for us. But then now, we are a lot more wiser, it has become a healthy affair for us too. 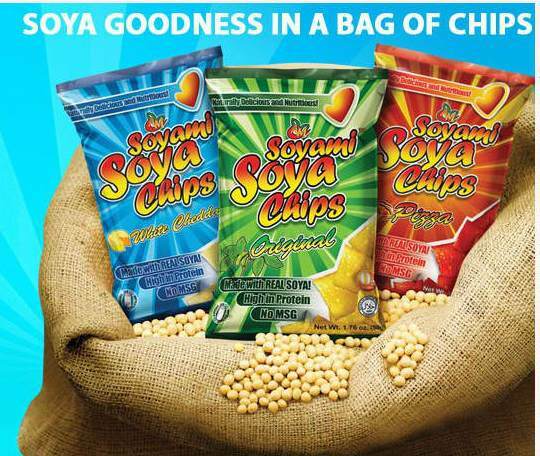 All the Soyami Chip flavors taste so good you wouldn’t even realize that it is made from soya. Since it does not have MSG, it doesn’t leave that strong salty, tangy taste that usually gives us the “umay” feeling after several consumption. But the best thing about it for me is that eveytime I snack on it, I wouldn’t have to worry about it doing serious harm to my liver. I wouldn’t have to worry about my triglycerides or my blood sugar shooting up because I can snack on it anytime since it is 100% healthy. I can definitely indulge in my simple pleasure of snacking on chips without the guilt with Soyami. It is indeed the healthier choice to snacking. 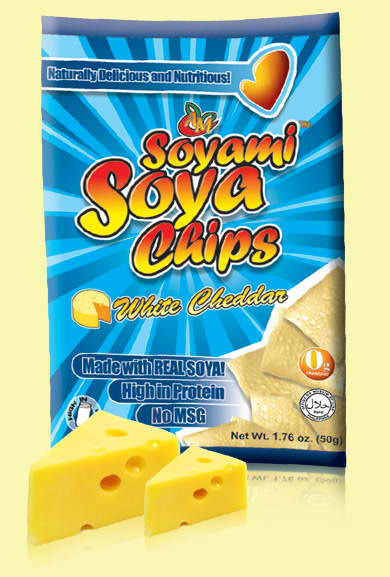 Soyami Soya Chips definitely tops my list of guiltless pleasure. 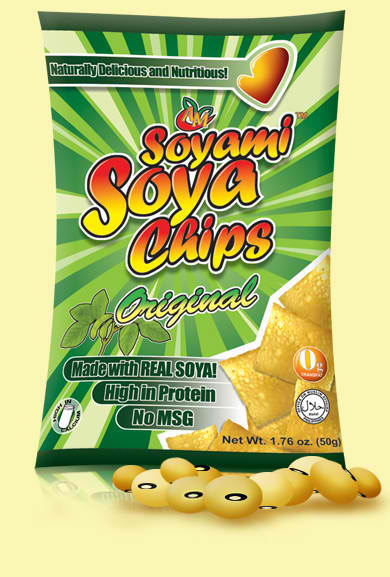 For more of Soyami Soya Chips products visit the following sites : Soyami in facebook, Soyami in Twitter, and Soyami website. Thank you for supporting the Soyami! Nice post!